The resonance of Black crystals is the lowest frequency in the color spectrum of light. Black crystals are known as the grounding stones of the crystal world. Black represents melancholy, death and decay, a sense of mystery, and invisibility. Black is also a symbolic color of sober authority, sadness and loss, and elegance. The color black is thought to be transforming and provides energetic space for self-understanding. 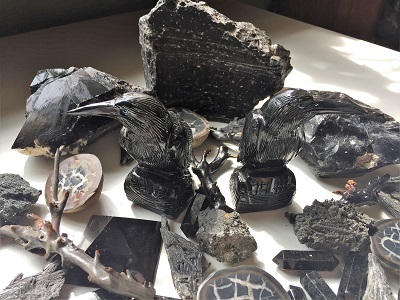 Black crystals may energetically represent the fear and terror we experience during allegorical travel to “the underworld” or on a spiritual journey through the “dark night of the soul” with re-birth and re-emergence of a better sense of self as the result. Black crystals may help you identify and move through energetic blockages caused by feelings of exhaustion, self-doubt, depression, inertia, helplessness, and confusion. Black crystals, due to their low frequency vibrations, support the understanding and importance of patience and perseverance, as we methodically move through denser energetic states on our pathway of growth and life experiences. Beautiful Black Coral from the Philippines. Shiny small sized metallic Black Hematite tumbled stones. Beautifully patterned black and white speckled Snowflake Obsidian spheres. Natural fan shaped Black Kyanite with mica and quartz crystal growth from Brazil. Amazing Natural Tektite Specimens with dense black pitted surface from China. Bright and vividly colorful Synthetic Calisilica Pendant. This Calisilica pendant is certainly an eye-catching piece of jewelry with its colors of turquoise, black and tan framed in a silver bezel. Morella Natural Black Smoky Quartz Crystal Geode from Mooralla, Eastern Victoria, Australia. Guinea Fowl Polished Jasper with black and white speckled markings and patterns that resemble the feathers of the indigenous Guinea Fowl from Congo, Africa. Gorgeous black natural vitreous Melanite Garnet from Michigan. Very good quality dark gray with lots of sparkle Spinoid Manganite natural crystal specimen with solver acicular and fanned formations. Limited quantities of these crystals are available from Wessels Mine in the Northern Cape, South Africa. Beautiful dark rose pink with black mottled pattern Polished Rhodonite large tumble stones from Madagascar, Africa. Naturally lustrous, striated Black Tourmaline Crystals from Brazil. Semi-polished Blizzard stone slab from Madagascar with beautiful black, serpentine-rich matrix amounts of Olivine, Chrome Garnet, Magnetite, Actinolite and Biotite. Beautiful natural black Amber from Indonesia.